An O-ring is a circular seal with a circular or oval cross section, hence the name. The O-ring is by far the most common seal in all ambits. The seals simple design and extreme variety of uses, even in very demanding situations and in very complex apparatus, have led it to be the most popular of all seals for all fluids, liquids as well as gases. With more than 3.500 standard sizes, ease of installation, low cost, low weight and variety of compounds, there is no other seal as versatile as the O-ring. 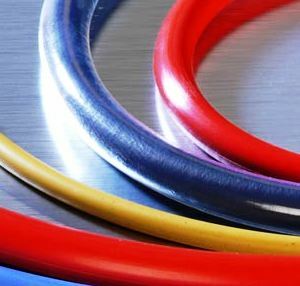 The O-ring is commonly manufactured in rubber compounds, although not exclusively as we also produce them in copper or PTFE among other materials. Choosing the correct material, and the materials hardness, are two of the main factors in choosing the right seal, depending on whatever needs and restrictions you may have for your application. Both parameters are fundamental to guarantee chemical resistance, heat resistance, traction resistance and other aggressive factors. Equally important is the correct design of the seat for the seal, depending on whether it is a dynamic or static application. Our technical department have tools available to help you calculate the gasket seat accordingly. 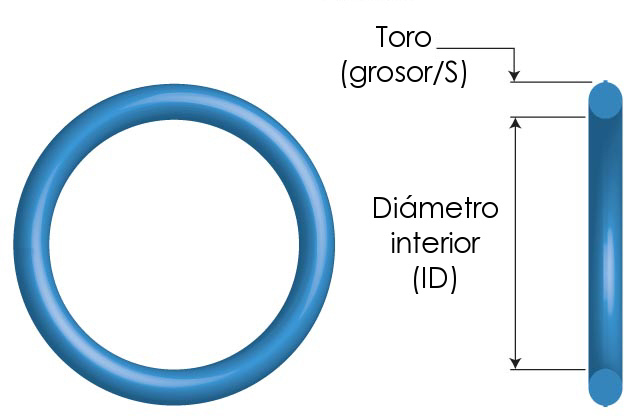 The correct size denomination of an O-ring is stating the inside diameter (ID) and the thickness (S), i.e. an O-ring with an inside diameter of 15mm and thickness of 3mm would be named as 15x3mm. -30ºC to +100ºC in dry and up to +80ºC in wet. FPM/FKM (VITON®) – Extraordinary chemical resistance, also resistant to petroleum, petrol, diesel, concentrated acids, thinners, ozone and oxygen. Working temperature: -20ºC to +200ºC. HNBR (HYDROGENATED NBR) – Aliphatic hydrocarbons, refrigerating fluids, ozone, etc. Working temperature: -50ºC to +150ºC. VMQ (SILICONE) - Resistant to mineral oils and grease of animal and vegetable origin, aromatic hydrocarbons, oxygen and ozone, hot air and steam. Long service life. Working temperature: -50ºC to +260ºC. Extremely high temperature resistance and chemical resistance. This is the most resistant material available. Working temperature: -20ºC to +320ºC. The XNBR has better tear resistance and tensile strength tan NBR and is therefore very suitable for dynamic applications. It is resistant to aliphatic hidrocarbons such as propane gas, butane gas and petroleum as well as vegetable and mineral oils and grease. Working temperature: -15ºC hasta +100ºC. 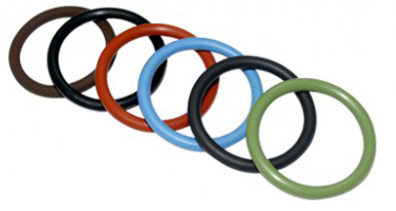 We can also deliver O-rings in other materials, such as: SBR, BR, CR, NR, IR, IIR, ECO, EU, CSM, ACM, AU, PVMQ, MFQ, and with approvals by: FDA, WRAS, NSF, KTW, UL, CLP (ACS), W270, DWGW (EN549/EN534/EN681). Practically any size can be made, from micro o-rings with ID of 1mm up to maxi o-rings with ID of more than 3.000mm. Anti extrusion rings are also a part of our range. These rings are recommended for use with oscillating or high speed movements and for pressures ranges over 80 bars. For short series of non standard and sizes we also manufacture o-rings from cord which we vulcanize or glue to the required size. Hollow o-rings are manufactured from tube. - O-rings should be stored at approximately 10ºC to 25ºC away from direct sunlight and any heat source. - To avoid condensation, as a rule the relative atmospheric humidity should be lower than 65%. - Artificial illumination with U.V. should be avoided. Alternatively the o-rings should be stored in plastic bags with U.V. filters. The seals should also be protected from ionized radiation and any ozone source such as mercury steam lights. - Avoid leaving the seal under any mechanical pressure which may deform them. For large sized o-rings you should twist the seal into a snail form for storage. - Also avoid contact with cleaning products, grease, oils and vapours from any of these products. - The seals should not be in contact with metals such as copper, iron and magnesium. - Do not mix o-rings made from different materials in the same container. - If talc is used to avoid self adhesion, the use of talc should be reduced to a minimum. - The o-rings should be used based on a “first come, first go” basis.